© 2019 Andrew P. Kurmis. The recently published work by Xarchas and colleagues [1Xarchas KC, Kyriakopoulos G, Manthas S, Oikonomou L. Hallux Osteoid Osteoma: A case report and literature review. Open Orthop J 2017; 11: 1066-72. [http://dx.doi.org/10.2174/1874325001711011066] [PMID: 29151998] ] describes the uncommon presentation of an osteoid osteoma in the distal phalanx (DP) of the hallux [2Jackson RP, Reckling FW, Mants FA. Osteoid osteoma and osteoblastoma. Similar histologic lesions with different natural histories. Clin Orthop Relat Res 1977; (128): 303-13. [PMID: 598169] ]. This well-written work makes a noteworthy contribution to the state-of-contemporary-understanding both as an individual case summation and as an elegant (albeit brief) review of the available literature. The management of symptomatic bony digital lesions is by no means a simple task or an insignificant undertaking. While malignant lesions are routinely managed by proximal transverse resection [3Kovachevich R, Giuffre JL, Shin AY, Bishop AT. Immediate Great Toe Transfer for Thumb Reconstruction After Tumor Resection: Report of 3 Cases. Ann Plast Surg 2016; 76(3): 280-4. [http://dx.doi.org/10.1097/SAP.0000000000000485] [PMID: 257105 53] ] (often a relatively simple procedure) – intending to limit remote spread and mortality – management of symptomatic benign lesions can pose great clinical challenges. Specifically considering osteoid osteomas, given anatomic barriers, the inability to safely offer modern RF ablation to digital extremities steers treating clinicians towards either aggressive (and likely prolonged) symptomatic management or consideration for surgical treatment [4Mylona S, Patsoura S, Galani P, Karapostolakis G, Pomoni A, Thanos L. Osteoid osteomas in common and in technically challenging locations treated with computed tomography-guided percutaneous radiofrequency ablation. Skeletal Radiol 2010; 39(5): 443-9. [http://dx.doi.org/10.1007/s00256-009-0859-7] [PMID: 20066410] ]. Poor tolerance and efficacy limit the former in many instances [1Xarchas KC, Kyriakopoulos G, Manthas S, Oikonomou L. Hallux Osteoid Osteoma: A case report and literature review. Open Orthop J 2017; 11: 1066-72. [http://dx.doi.org/10.2174/1874325001711011066] [PMID: 29151998] , 5Kurmis AP, Kurmis TP, O’Brien JX, Dalen T. The effect of NSAID administration on acute phase fracture healing: a review. JBJS [Am] 2012; 94(9): 815-23. [http://dx.doi.org/10.2106/JBJS.J.01743] [PMID: 22552671] ]. While amputation can seem an ‘easy’ option, the loss of a hand digit or (especially) a border digit of the foot can have major functional ramifications [6Bhat AK, Acharya AM, Narayanakurup JK, Kumar B, Nagpal PS, Kamath A. Functional and cosmetic outcome of single-digit ray amputation in hand. Musculoskelet Surg 2017; 101(3): 275-81. [http://dx.doi.org/10.1007/s12306-017-0484-x] [PMID: 28681161] ]. Driven by ever-increasing societal expectations of enduring function [7Kurmis AP. Review article: thromboprophylaxis after total hip replacement. J Orthop Surg (Hong Kong) 2010; 18(1): 92-7. [http://dx.doi.org/10.1177/230949901001800121] [PMID: 20427844] ], and a general reluctance to take up digital prosthetics [8Kuret Z, Burger H, Vidmar G, Maver T. Adjustment to finger amputation and silicone finger prosthesis use. Disabil Rehabil 2018; 1-6. [http://dx.doi.org/10.1080/09638288.2018.1424954] [PMID: 293228 12] ], patients continually push us to consider local reconstructive options. These are often no mean feat. Equally, from a patient perspective, the cosmetic impact of surgical management weighs heavily [9Yun MJ, Park JU, Kwon ST. Surgical options for malignant skin tumors of the hand. Arch Plast Surg 2013; 40(3): 238-43. [http://dx.doi.org/10.5999/aps.2013.40.3.238] [PMID: 23730600] ]. Resection, digital shortening and fusion-type procedures [10Jowett CR, Singh D. Osteoid osteoma of the great toe: A case report. Foot Ankle Surg 2010; 16(2): e12-5. [http://dx.doi.org/10.1016/j.fas.2009.04.005] [PMID: 20483118] ] are commonly effective in the hand and are usually well tolerated – especially with lesions isolated to single phalangeal segments. Even in the thumb, these can usually be performed with confidence knowing that a ‘functional’ oppositional grip can be maintained [11Harenberg PS, Langer MF, Sproedt J, Grünert JG. Compression plate arthrodesis for osteoarthritis of the first carpometacarpal joint: A retrospective study of 77 cases. Hand Surg Rehabil 2018; 37(1): 48-55. [http://dx.doi.org/10.1016/j.hansur.2017.10.235] [PMID: 29249610] ]. Given the broad range-of-movement of the 1st MCP, such procedures inherently afford some margin for safe error in ‘ideal’ fusion position. The same cannot be said for the hallux. Even small variations in digital length, and most certainly the attitude of the MTP, greatly alter load-bearing contact pressure distribution and potentially the mechanics of ambulatory gait. Transverse metatarsalgia [12Doty JF, Coughlin MJ. Metatarsophalangeal joint instability of the lesser toes. J Foot Ankle Surg 2014; 53(4): 440-5. [http://dx.doi.org/10.1053/j.jfas.2013.03.005] [PMID: 23602716] ], pressure necrosis [13Kawai M, Mihara S, Takahagi S, Iwamoto K, Hiragun T, Hide M. Evaluation of skin perfusion pressure to assess refractory foot ulcers. J Wound Care 2017; 26(5): 267-70. [http://dx.doi.org/10.12968/jowc.2017.26.5.267] [PMID: 28475443] ] and tibialis posterior fatigue failure (leading to arch collapse) [14Ritzmann R, Freyler K, Werkhausen A, Gollhofer A. Changes in Balance Strategy and Neuromuscular Control during a Fatiguing Balance Task-A Study in Perturbed Unilateral Stance. Front Hum Neurosci 2016; 10: 289. [http://dx.doi.org/10.3389/fnhum.2016.00289] [PMID: 27378886] ] are all concerning potential complications. The need to chase ‘add on’ procedures (i.e. sequential lesser digit shortenings or midfoot fusions) [15Suh YC, Kushida-Contreras BH, Suk H, et al. Does reconstruction preserving the first or first two rays benefit over full transmetatarsal amputation in diabetic foot? Plast Reconstr Surg 2018. [Epub ahead of print]. [http://dx.doi.org/10.1097/PRS.0000000000005122] ] to rebalance the foot can lead an unwary surgeon down a slippery-slope of patient dissatisfaction. The current work also evokes some controversy in considering ideal local management of the phalanx after en bloc resection. While the article provides clear intra-operative images and post-operative radiographs of what appears a very precise and cleanly executed local resection I, and others who have seen the work already, raise question of the structural stability of the residual lateral waif of bone extending distally. Reassuringly, the authors report no fracture through this residual bony projection to two years follow up. Equally though, details regarding any enforced weight-bearing restriction or means of protecting the phalanx during early load-bearing are scant. Immediately adjacent to the key distal load-bearing point of Rang’s tripod [16Morton DJ. The human foot: Its evolution, physiology and functional disorders. BJS 1936; 24(93): 200-8. ], certainly one should be cognisant in maintaining awareness of this post-operatively. Given the paucity of robust literature to guide decision-making in the specific setting of osteoma resection and subsequent bony reconstruction, many available options have been translated from post-traumatic care [17Dusseldorp JR, Allan JM, Van Der Leeden MH, Phoon A. Distally-based osteocutaneous dorsal metatarsal artery flap for hallux reconstruction. J Plast Reconstr Aesthet Surg 2014; 67(9): 1291-4. [http://dx.doi.org/10.1016/j.bjps.2014.04.013] [PMID: 24931772] ]. While the principles may be common, the realities are very different. The local uptake and healing journey of an uncontrolled traumatic subtotal amputation versus an elective surgical partial resection are vastly different. The infection risk, local vascular conditions, soft tissue envelope/tissue loss, and the involvement of critical local anatomic structures are poles apart. There is merit in en bloc resection and preservation of the residual phalanx (as has been reported by Xarchas and colleagues [1Xarchas KC, Kyriakopoulos G, Manthas S, Oikonomou L. Hallux Osteoid Osteoma: A case report and literature review. Open Orthop J 2017; 11: 1066-72. [http://dx.doi.org/10.2174/1874325001711011066] [PMID: 29151998] ]). Autologous grafting would seem a reasonable option whereby <50% of the phalangeal width remains - the general shape of the phalanx lends itself nicely to a small solid iliac crest graft. Morselised or synthetic graft options likely have a limited role given the inability to effectively achieve local containment. Post-operative care and activity restrictions after distal hallux resection also requires due consideration. Given the common demographic anticipated for osteoid osteoma presentation (i.e. 2nd to 3rd decade of life) [18Atesok KI, Alman BA, Schemitsch EH, Peyser A, Mankin H. Osteoid osteoma and osteoblastoma. J Am Acad Orthop Surg 2011; 19(11): 678-89. [http://dx.doi.org/10.5435/00124635-201111000-00004] [PMID: 220526 44] ], this patient cohort is likely relatively healthy with good local bone stock and quality. Given the small reported case volume of DP osteoid osteomas, it is unclear whether the characteristics of this very-specific subgroup matches that of the rest of the known osteoma patient pool [18Atesok KI, Alman BA, Schemitsch EH, Peyser A, Mankin H. Osteoid osteoma and osteoblastoma. J Am Acad Orthop Surg 2011; 19(11): 678-89. [http://dx.doi.org/10.5435/00124635-201111000-00004] [PMID: 220526 44] ]. While no evidence-base or accepted guidelines exist, one might suggest that if >50% of the bony phalangeal width remains after lesion resection, that perhaps these patients can be safely managed with attention to wound healing then return to normal weight-bearing as tolerated. Whereby complete lesion excision requires that <50% of the bony phalangeal width be left as residual stock, it would seem reasonable to consider either grafting (e.g. autologous iliac crest block graft with mini-fragment screw fixation) or an extended-period of protected weight-bearing. A modified Morton’s extension plate splint may appropriately meet this need [19Taranow W, Schoenhaus H, Limaye R, Smith WB, Smith WB, Brigido SA. Advanced hallux rigidus: do we have a choice other than arthrodesis? Foot Ankle Spec 2015; 8(2): 119-24. [http://dx.doi.org/10.1177/1938640015577078] [PMID: 25780268] ]. How the distal hallux will remodel with time – especially in this young and presumably high-demand cohort – is also unclear. Equally, how effectively (and over what timeframe) local grafting will integrate given the relatively poor distal blood flow and the pathologic bone bed into which it is placed, remains unknown. The delicate local fixation of any solid graft also bears the inherent risks of implant failure, loss of fixation and local irritation (there may simply not be enough local bone stock to adequately bury headless screws) [20Tóth K, Kellermann P, Wellinger K. Fixation of Akin osteotomy for hallux abductus with absorbable suture. Arch Orthop Trauma Surg 2010; 130(10): 1257-61.]. In summary, the paper of Xarchas and colleagues [1Xarchas KC, Kyriakopoulos G, Manthas S, Oikonomou L. Hallux Osteoid Osteoma: A case report and literature review. Open Orthop J 2017; 11: 1066-72. 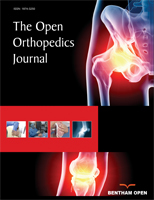 [http://dx.doi.org/10.2174/1874325001711011066] [PMID: 29151998] ] meaningfully contributes to the very limited clinical pool of understanding regarding management of DP osteoid osteomas – most specifically in the great toe. The work provides a succinct summary of the limited contemporary evidence-base and provides a framework around which to consider management of future patients under similar conditions. While the reported case seemingly achieved a good endpoint clinical result to two years of follow up, the lack of detail regarding post-operative care and function provides an opportunity for further enquiry. Consideration to alternative surgical management options, most pointedly local bony reconstruction/ reconstitution of bone stock, provides food for thought. Morton DJ. The human foot: Its evolution, physiology and functional disorders. BJS 1936; 24(93): 200-8. Tóth K, Kellermann P, Wellinger K. Fixation of Akin osteotomy for hallux abductus with absorbable suture. Arch Orthop Trauma Surg 2010; 130(10): 1257-61.